Along with working on completing our 2011 chronological albums, this month I've also been striving to catch up with processing photos from last year. As I mentioned a couple of months ago, I'm creating some digital layouts along the way. This two page layout allowed me to showcase eleven photos from our day in Edmonton this past summer. 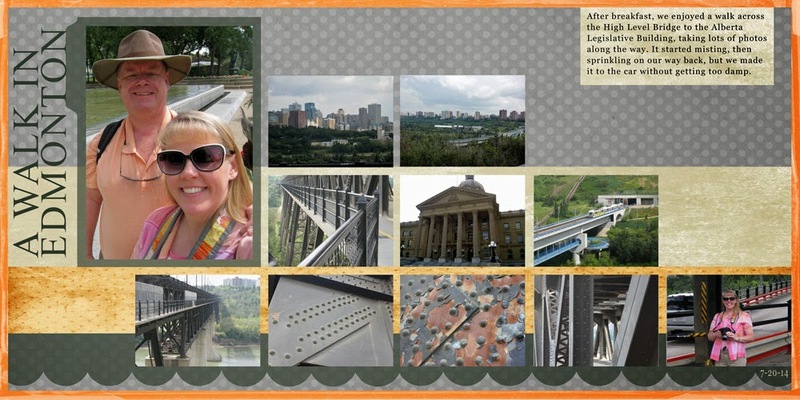 Journaling reads: After breakfast, we enjoyed a walk across the High Level Bridge, taking lots of photos along the way. It started misting, then sprinkling on our way back, but we made it to the car without getting too damp. I also created two layouts showcasing photos from our trip to Ohio in the fall. 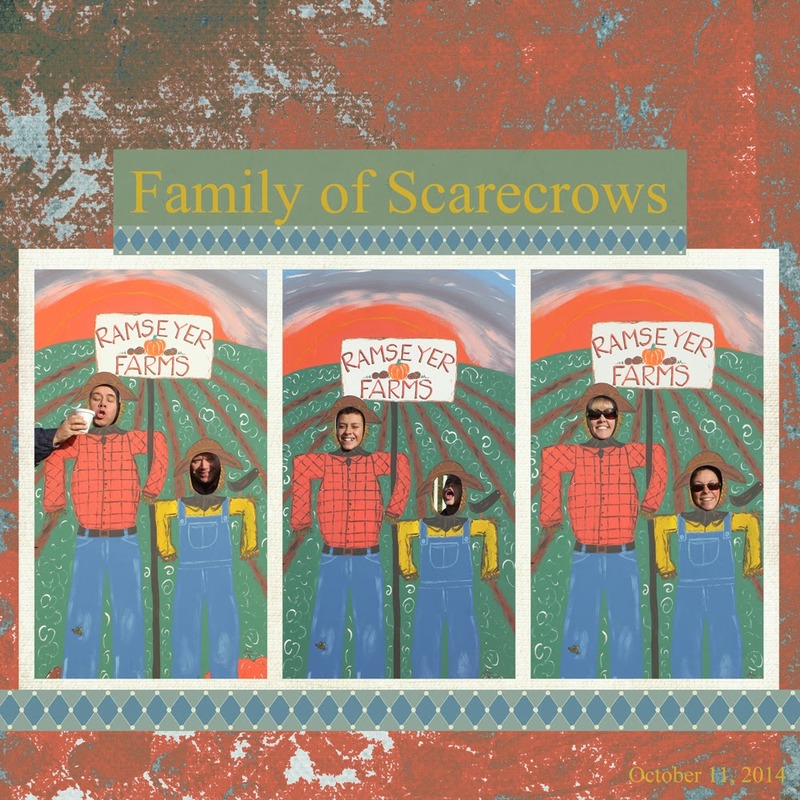 Journaling reads: When Tommy & Kathy suggested we go to the corn maze, we had no idea what to expect. They had not been there either but knew about it because Thomas's class had gone several years ago. 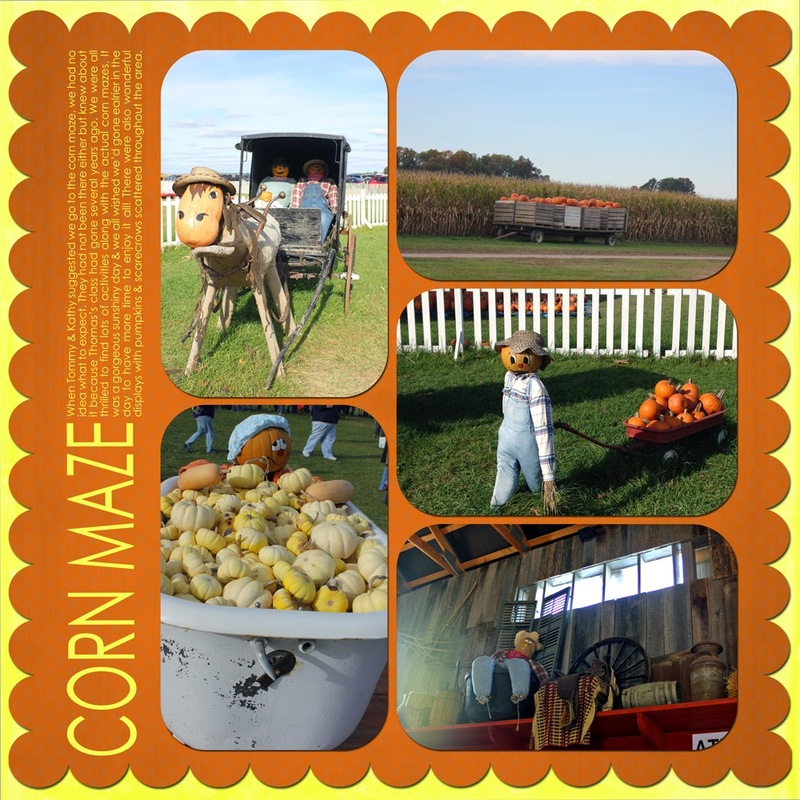 We were all thrilled to find lots of activities along with the actual corn mazes. It was a gorgeous sunshiny day & we all wished we'd gone earlier in the day to have more time to enjoy it all! There were also wonderful displays with pumpkins and scarecrows scattered throughout the area. I've also ordered lots of photos that I'll add to my storage binders to be scrapped when the INSPIRATION strikes. I'm currently up to mid-November in my digital workflow, so I'll be working through the photos from our Florida trip next. Have you processed and/or printed your 2014 photos? You amaze me, I have enough trouble sticking with working through one long-term project at a time, and here you are tackling two. That in itself is inspiring. We're going to be in Edmonton for a day this summer. Any suggestions for things not to miss? i have long since given up on 2014 (apart from a digital photobook whihc is in the making) and am likely to fall behind in 2015 too! I admire how you keep things so organised and moving along. I'm happy to say that I actually keep up with my digital organization. I have a good workflow for downloading and key wording my photos each month. I just need to add doing some scrapbooking into my workflow and sticking to it. It's great that you create pages when your inspired. I still get hung up on doing pages in order. Part of working on my scrapbooking will definitely be printing out pictures. I think I will also make a photo book of our trip to Barcelona and (probably) Clara's track/XC photos. But I haven't figured that out for sure. Oh, you are so right: printing photos is something I need to do. I've asked TSO several times if she'd even like to make a photobook with all her Disney pictures. She has yet to be persuaded that they'll look even better in her hand rather than on her phone.